I know you guys know how much of a bookworm I am through this blog. Aside from fashion, a book is another world that I love and dreamed to conquer someday. There are only a few stores that combines both elements and one of them is Quotation Marks. I stumbled upon them through Twitter and their goal is to incorporate your favorite quote on one of our favorite fashion accessories: scarves! I, myself are both obsessed with scarves and quotes. 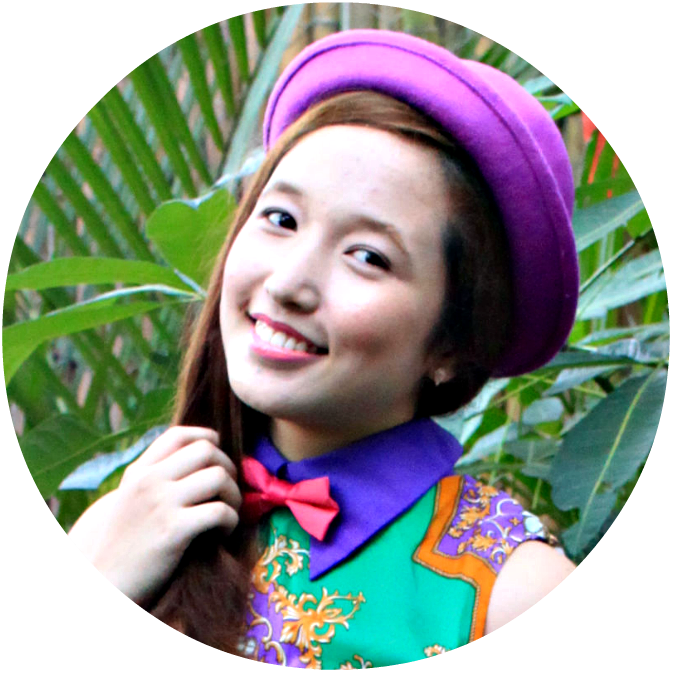 So in this post, you'll get to meet the amazing person behind the shop, Farell, and you are in for a special treat so read on! ME ♥ Hi Farrell! It is great to be interviewing you! I would love to know more about you and the brand. So first things first: what is Quotation Marks all about? I am really excited to talk about Quotation Marks because it is still a very new shop! 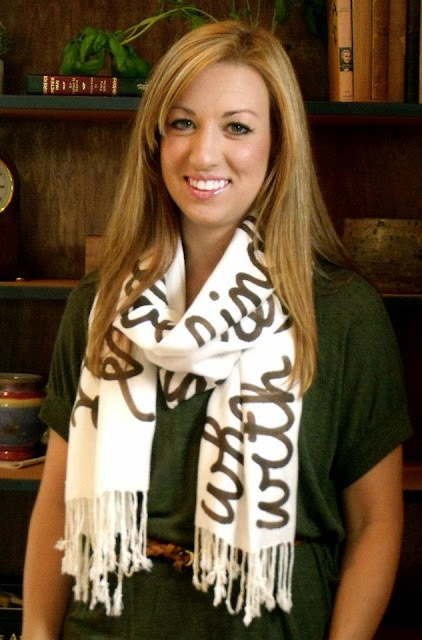 Last Christmas, I made the very first script scarves for my friends and family. I was tired of trying to find the perfect gift and so I decided to make it myself! I picked out a different quote for each of my family members and friends and wrote them on a soft scarf. They LOVED them. It was a perfect moment, that moment when a gift actually succeeds in conveying all the love and friendship you feel for someone. With their encouragement, I started the shop, so that I could help everyone give the perfect gift! FARELL ♥ The goal of Quotation Marks is to provide everyone with their favorite quote on their new favorite accessory. Every time that somebody is given a script scarf, I hope that they achieve that perfect moment when they realize how much the giver loves them and know them. It is a very special thing to pick out a script scarf for someone and pick the perfect quote and the perfect color. I love working with people to achieve this amazing 'aha' moment with their friends and family just like I did last Christmas! FARELL ♥ I love words and am often inspired by my favorite characters in novels and stories. 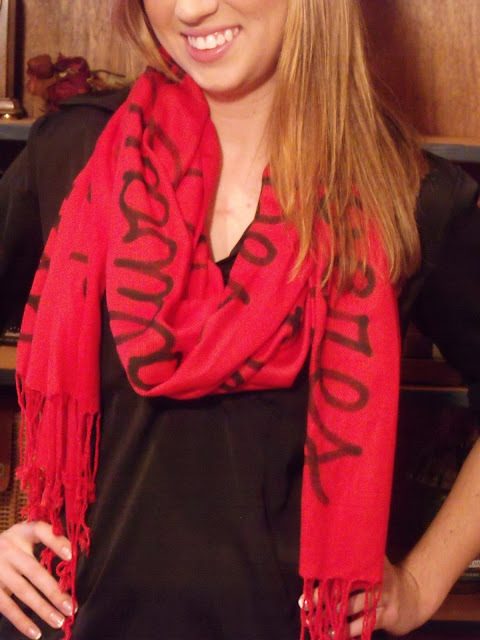 For example, the Peter Pan script scarves remind me of the years that I read Peter Pan over and over again. I am also inspired by poets who say something just right, like 'I carry your heart' by E.E. Cummings. 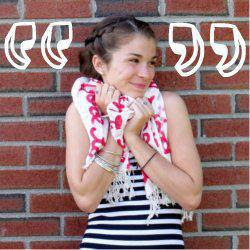 Words like these make Quotation Marks script scarves not only a nice gift, but an articulate one! FARELL ♥ Quotation Marks started as a side project, and as a result, I have become a very busy person! I work a great day job, attend grad school, and run Quotation Marks. An average day includes waking up early and responding to Quotation Marks emails over a cup of coffee before heading to work. I also post the quote of the day on my blog (quotationmarksetsy.com) and on my Facebook page (facebook.com/quotationmarksetsy). In the evenings I make scarves and brainstorm with my husband, who is (as of this month) the Quotation Marks Business Manager. We love dreaming up new promotions, quotes, and ideas! FARELL ♥ Actually, it's still in the works! I am just starting to turn one of the rooms in my office into the work room. I plan to fill it with lots of quotes, lots of books, and lots of scarves! FARELL ♥ Quotation Marks captures the essence of the shop- the quotes! It is the words that makes the script scarves so special. FARELL ♥ I have a few secret ingredients that I think set my scarves above the rest! First of all, I love what I do! So whether I am emailing a customer or editing images, there is a lot of love put into the making of every single scarf. Secondly, I have awesome models! They have stuck with me from the very beginning and they help the scarves come alive. Another thing that really helps me to keep things interesting is my blog (quotationmarksetsy.com). I post a quote a day, and I love to see which quotes my readers get the most excited about! FARELL ♥ I am always working on new scarf ideas. For example, for Valentine's Day I have introduced the very first red scarf. FARELL ♥ Yes, Quotation Marks scarves at sold at The Red Dress is Ashland, Massachusetts. They feature an exclusive line of scarves that are updated each season! FARELL ♥ I love keeping up with fashion. One of my best friends once told me that when she gets dressed in the morning it's like putting together a piece of artwork! It's a really fun outlet for my creative side. FARELL ♥ Leather jackets, skinny jeans, and my Michael Kors watch! FARELL ♥ I am currently obsessed with wedge shoes! Also the topknot--I think I wear my hair in a high bun every single day! ME ♥ 5 bestsellers of Quotation Marks and tell us how will you wear or style it? FARELL ♥ Oh I am so excited to answer this question! Shakespeare scarf: This scarf sells a lot in the UK! To me is the epitome of all this seasons' Pantone colors. 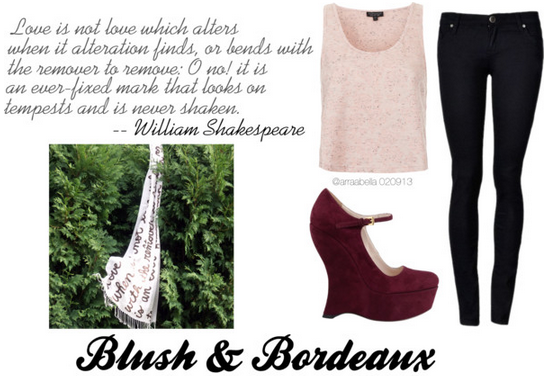 So I picture it with a blush shirt, black skinny jeans, and some Bordeaux wedges. Peter Pan scarf: This one is for all my fellow book lover's out there. 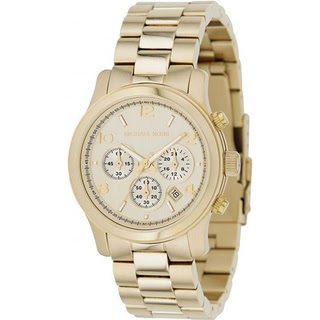 Pair it with a loose white tee, a high bun, and soft floral skinny jeans. Then curl up in a corner and read to your heart's content! The Winnie the Pooh scarf: I love pairing this scarf with lots of necklaces to dress it up a bit. Long gold necklaces paired with a gold bib necklace look especially stunning with the pink. Wear with pearls, loosely curled hair, and a lacy black dress and you're ready for a night on the town! The Shema: This purple scarf is one of my favorites. 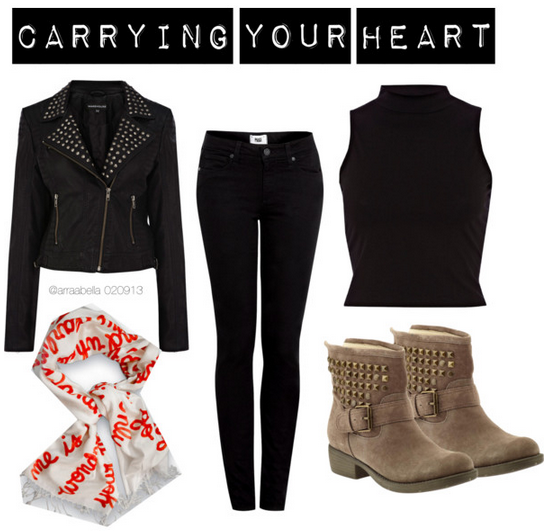 Wear with a long chunky sweater, skinny jeans, and Sperrys! FARELL ♥ About 5 different kinds of lipgloss, my nook, my leather gloves, wallet, cell phone, and a gluten free snack! ME ♥ Wow! different lipglosses! Well, I carry 3, too, just in case. :) Any current reads? All-time favorites? FARELL ♥ I just finished reading the Matched series and I love it. 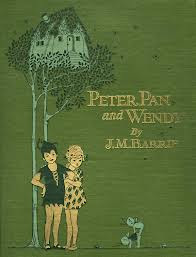 I studied Literature in college but my favorite books are still the ones that can take me to another world! 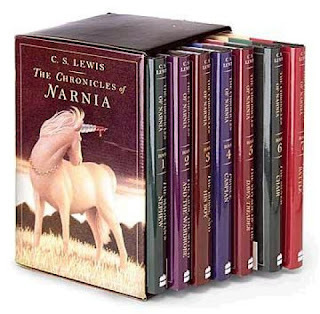 Lots of Narnia, Peter Pan, Tolkien, and young adult fiction for me!! ME ♥ I will definitely add those in my reading list! Any current playlist? ME ♥ I will definitely included that on my playlist. Thank you so much for allowing me to interview you and sharing this piece to the world. More power to the shop! FARELL ♥ My pleasure! I loved answering these questions and getting to share about the thing I am most excited about--my shop! Ok, and fashion--I got pretty excited to talk about the fashion. ;) Thanks Arra! For all my reader and all the book & fashion lovers out there, here is the exciting treat I was talking about earlier! Here is a 15% OFF discount code from Quotation Marks that you can avail until Valentines' Day (Feb. 14). Buy your loved ones scarves with all the love quotes we know by heart and too sweet that we can't resist to wear! So what are you waiting for? SHOP NOW!